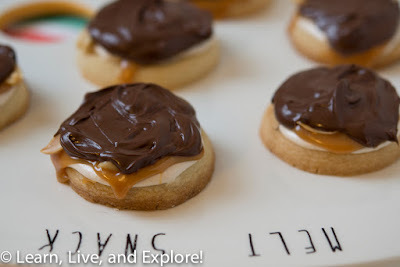 Snickers Cookies ~ Learn, Live, and Explore! These Snickers Cookies can get a little messy, but the taste is worth it. I was a little tempted to sprinkle some sea salt on them because I've been obsessed with salted chocolate and salted caramel lately, but I resisted to preserve the honest taste of a Snickers bar. While start to finish, these took a few hours to make, there were decent breaks between the layers because of cooling time, so it's not as intense as it may seem. A lot of dishes though! Anyway, if you're craving some chocolate, peanut butter, caramel, and nougat, check out these Snickers Cookies, inspired by Chef in Training!